Spring is in full bloom and the skiing is definitely reflecting that. Due to the early daylight savings time change this year, the mountain doesn't soften up until around 1 pm. The mornings are about as hard packed and slick as you can get. Those who adhere to the Aspen Spin Ski Strategy (ASSS) know that lift 1-A and the tubes are the place to be. 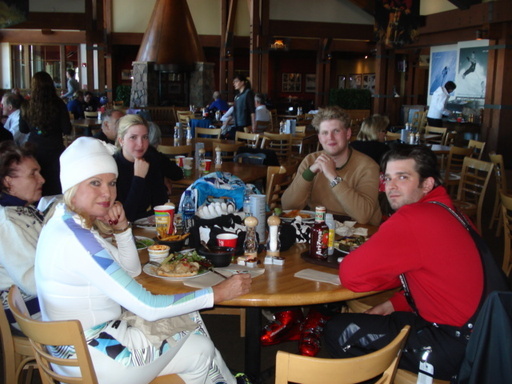 Shown below is a celebrity family enjoying lunch at the Sundeck. Aspen Spin is reluctant to actually publish their name because our media insurance policy has not yet been purchased. If you watch NBC at 9pm EST on Sunday's you'll know who they are. Also spotted in the crowd, (sorry no pix) the "bottle rocket" himself, Owen Wilson. We're still having a ball, get out here and join us.